Last year on one of my regular tips to Northern Italy, we were treated to a display of the various aspects of traditional ringing in the Ambrosian system at Roncobello near Bergamo. This consisted of three aspects: (1) full circle ringing but with only one controllable stroke and about 80% counterbalance! (2) melodies on the eight bells, played with a carillon keyboard situated amongst the bells, and (3) a concert of traditional bell music played on campanine, a type of glockenspiel but with tubes instead of plates. This was all the more impressive as the Scuola was formed to try to maintain traditional ringing in the area and thereby stave off electrification. The Scuola consists of 20+ young ringers, aged between 6 and 18 led by Luca Fiocchi, a teacher. As I always do when in Italy, I invited them to Suffolk to see English ringing. I was very pleased when Luca contacted me and said they proposed to come in July - 18 youngsters and 13 accompanying adults. A bit of a headache getting suitable accommodation in peak season but eventually successful. We decided that a coach was the best option for transport and agreed a timetable, which included to my pleasant surprise a concert of their campanine and other instruments. They arrived on Wednesday 23 July and were taken direct to Lavenham, one of Suffolk's most famous towers to hear an old style ring. After sightseeing, a further demonstration at Ipswich on the modern twelve. A barbecue at my house completed the day, before retiring to their hotel. Thursday saw a day's sightseeing in London, followed by Fish and Chips back in Felixstowe. On Friday, a chance for hands on try of English bells at Orford, followed by a visit to the castle. A look at Woodbridge, a meal and then the concert at Grundisburgh. Well received by everyone including the organist, John Cooper, father of Tina Sanderson. Farewells on the Saturday, back to the airport via Cambridge. 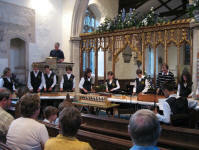 My thanks to all the local ringers who helped, particularly Richard and Sarah Moody at Orford. Hopefully we will see them again, possibly in smaller numbers, for a more serious try at our system.